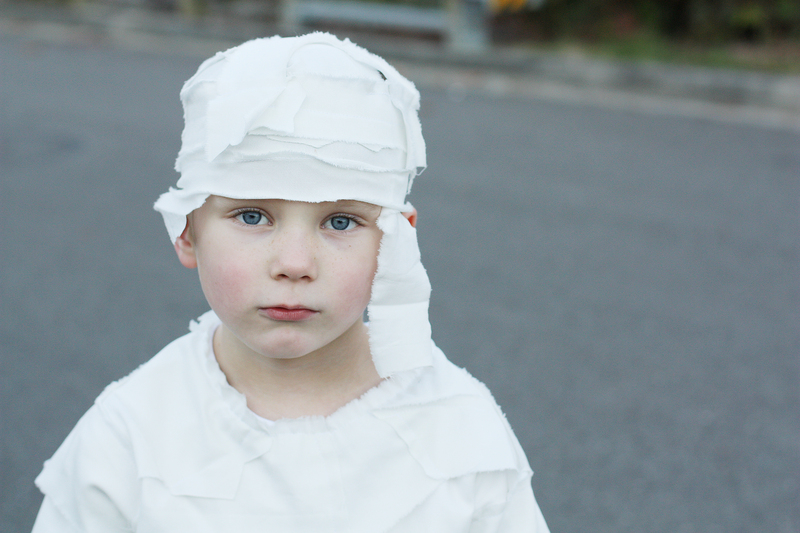 I got away with making just one Halloween costume this year, this DIY Mummy Costume for Wyatt. 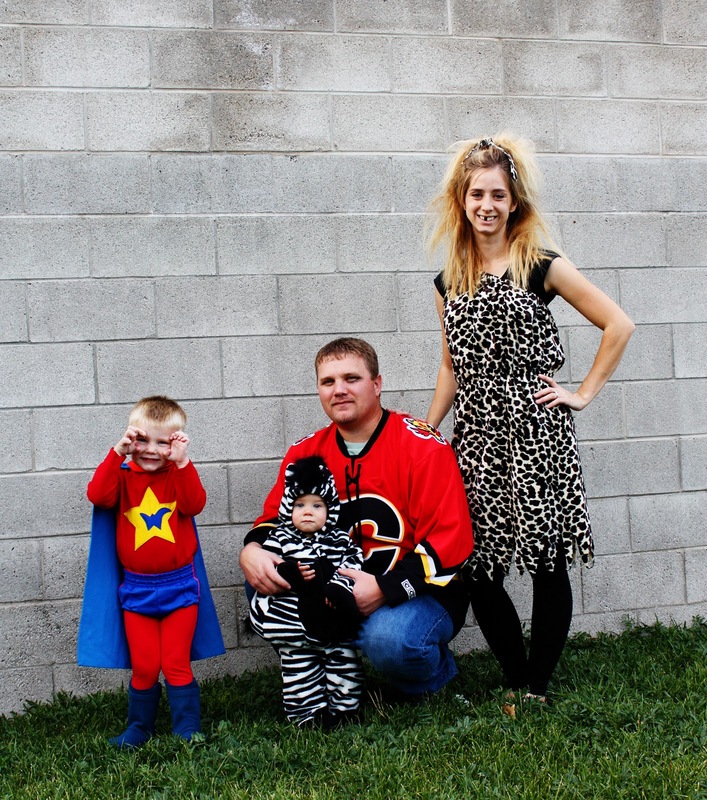 Lola will be wearing the zebra costume that both Wyatt and Weston wore for a couple of years each as toddlers, and Weston will be wearing a superhero costume that Wyatt wore a few years ago. 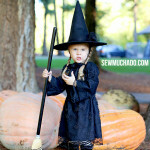 I found this blog post about the same costumes from the year that Wyatt and Weston wore them, and this photo: When I first looked at the photo I thought that Lola was Weston for a second. 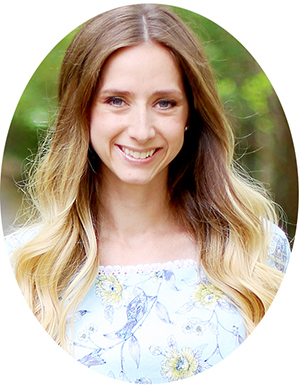 I have never been able to figure out who she looks like so it was fun to see a resemblance. And I’ll be wearing my go-to cavewoman costume for year number 4. 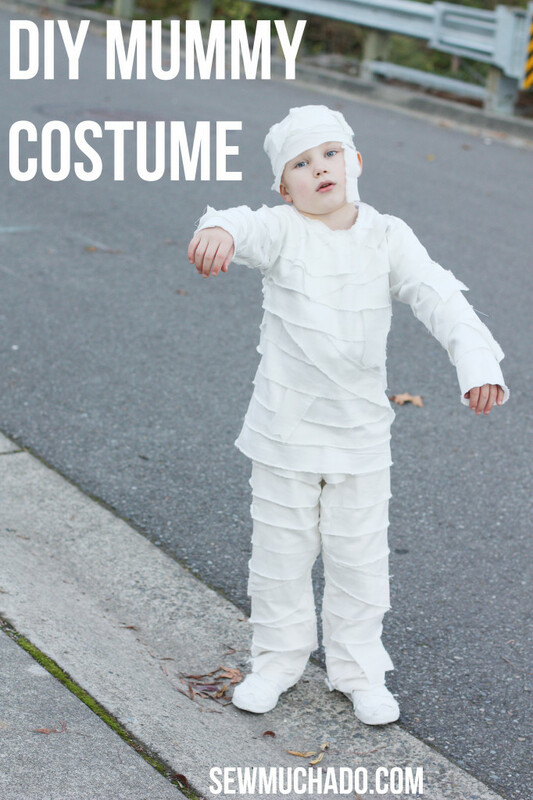 Let me tell you, that costume has been well worth the hour it took to make! And I’m sure this year won’t be my last wearing it :). 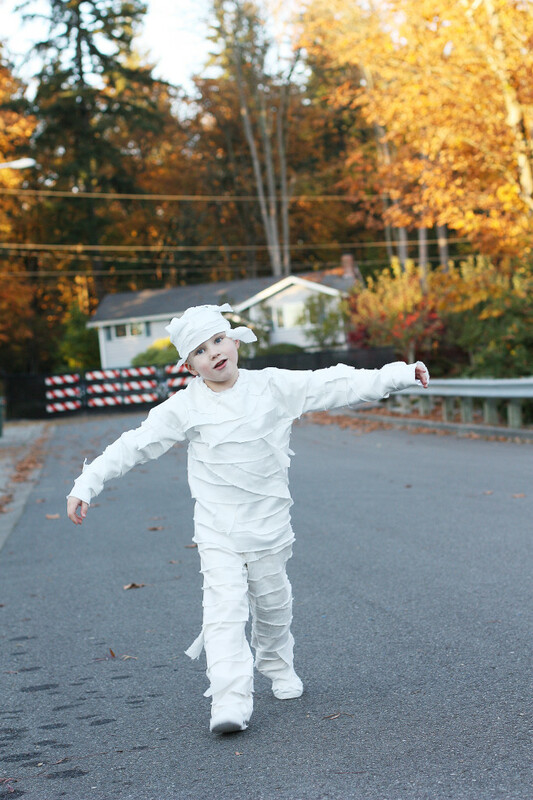 So, on to this year… Wyatt went back and forth between a few ideas for his costume, but together we eventually decided on making him a DIY mummy costume. He can’t wear the costume without playing the part, I tell ya. I lucked out and found the white twill in the $1/yard section at Walmart. I was planning on heading to Jo-Ann to buy white muslin after our Walmart stop that day, so I was a happy camper. It worked great for all of the strips, and I ended up using all but a tiny bit of the three yards. For the top I used a white long sleeve knit t-shirt, a couple of sizes too large for Wyatt since there wouldn’t be any room for stretch once the strips were sewn on. Before sewing the strips on, I cut up each side and sleeve seam so I could sew the strips with the shirt opened up and flat. 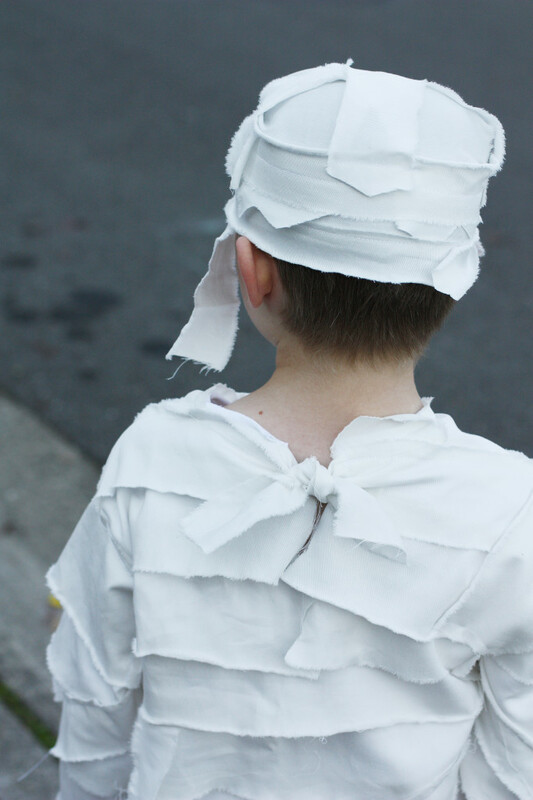 I also cut a slit in the back neck to allow the shirt to fit over Wyatt’s head. When I added the strips, I left a couple extra long so they could tie the opening shut. For the bottoms, my first try was a major fail. For the base, I used a pair of thermal underwear that we already had, and ended up cutting them off of not one but both of my boys at different times. 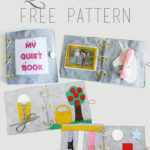 Funny now, not so funny at the time… I needed a lot more room in the pants, so for the second attempt I used this free pajama pants pattern (it’s a great one and I have plans to use it for real pajamas soon! ), and sewed all the strips on before piecing the pants together. I used an off-white flannel that I’ve had in my stash for years, which felt great to use! The pants fit perfectly that go-around, and have just enough room for movement while not being too baggy for a mummy. I made the hat by basically starting with a base strip that fit around Wyatt’s head and then adding one or two more pieces at a time until it looked right. I’m still not sure that it looks 100% right, but it’s done :). 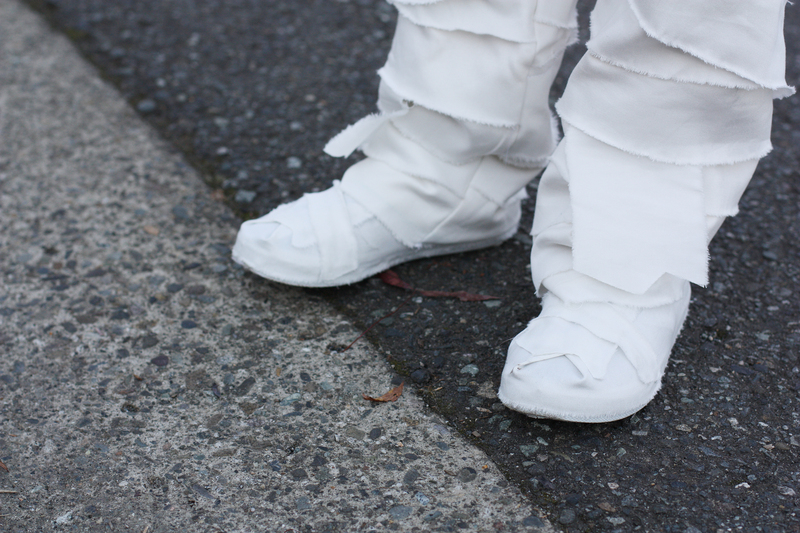 His shoes were made by hot gluing the fabric strips to a pair of $6 slip on Walmart shoes. 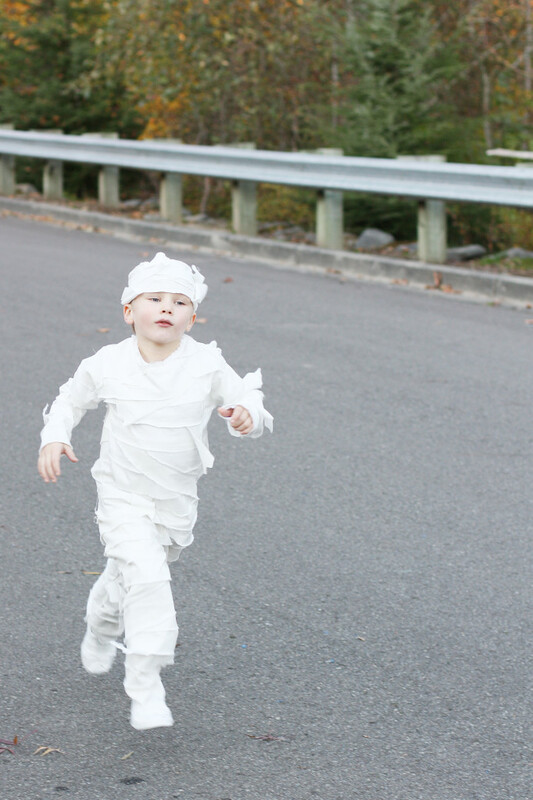 It only took about 2.5 seconds of Wyatt being outside in his costume yesterday before the neighbor girls had a mummy chasing them down the street, lol. 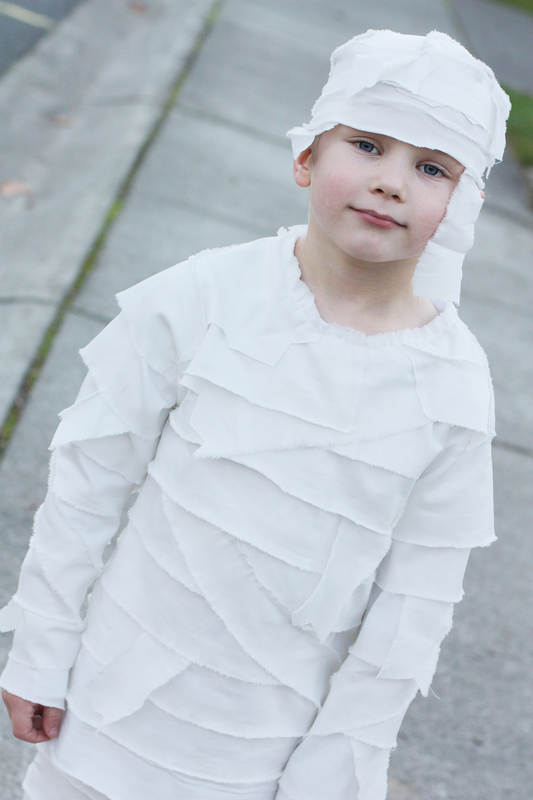 I feel like it’s been forever since I’ve sewn anything for Wyatt, so I really enjoyed this DIY mummy costume project (after the first fail, that is). He’s so rough on his clothes now that I feel like it’s often not worth it to spend the time sewing him clothes that could be wrecked after a few uses. But I sure do love this 6 year old and love seeing how pleased he is with himself in his costume! Love his costume but the best part is the way he’s getting into it. The kid is awesome. 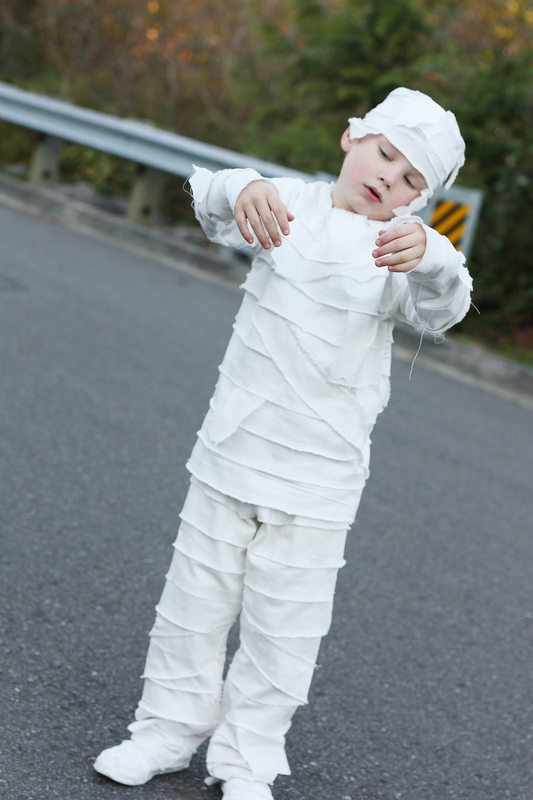 I love this Mummy and especially how he got into it with the arms, lol. Great job! Thanks Nicole! He did pretty good at always staying in character, lol :). Cute Abby! 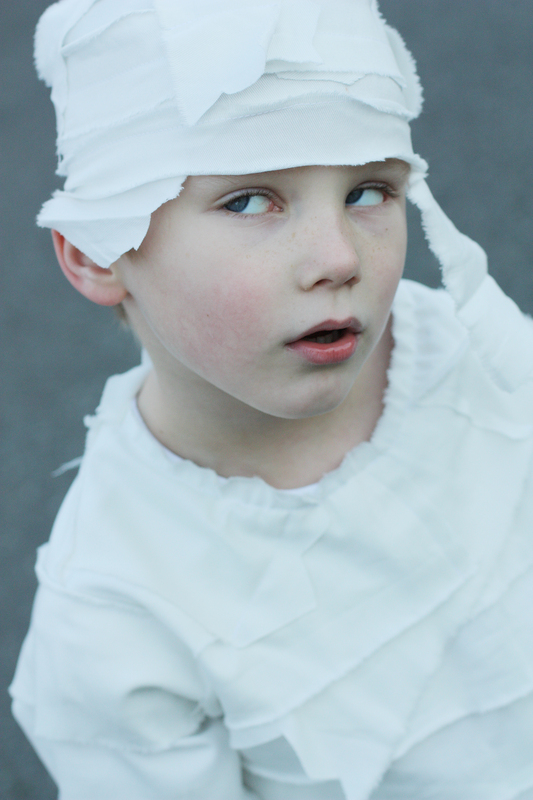 I made Everett a mummy costume his very first Halloween..great way to go. Thanks Jenn! I remember seeing photos of Everett in his costume! So cute! 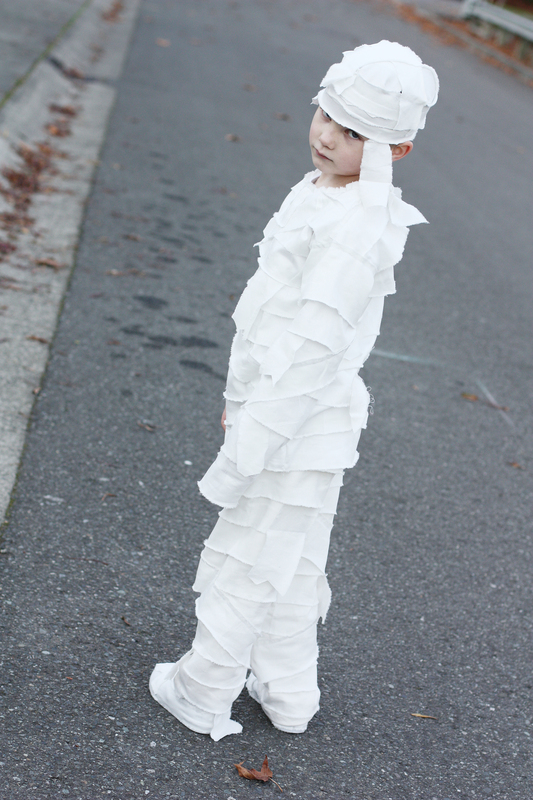 I think this is one of the best mummy costumes I’ve seen! So fun! Thanks so much, he loved wearing it!